Devon Prep senior Jason Sadek portrays Jesus crucified during the school's presentation of the Living Stations of the Cross April 13. Graham Alabdulla (center), portrays Simon helping Jesus (portrayed by Jason Sadek) carry his cross. Sean Bevan plays the Roman soldier at left. Many area Christians prepare for Holy Week by marking the Passion of Jesus Christ. 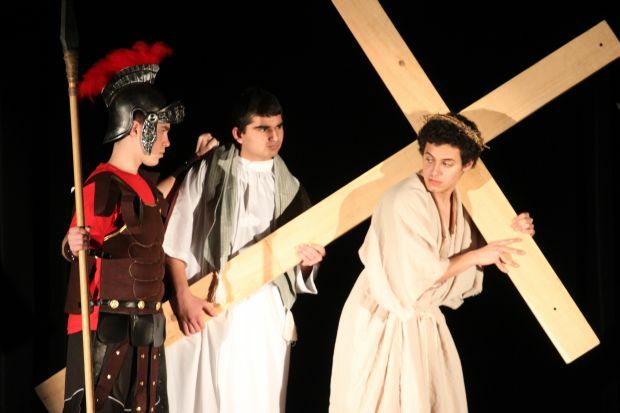 At Devon Preparatory School a group of juniors and seniors and several faculty members helped the school community prepare for Easter by presenting the Living Stations of the Cross on April 13, a dramatization of Jesus’ journey to Calvary leading up to his crucifixion. The object of the 14 stations is to help the faithful to make a spiritual pilgrimage to the major scenes of Christ’s sufferings and death. 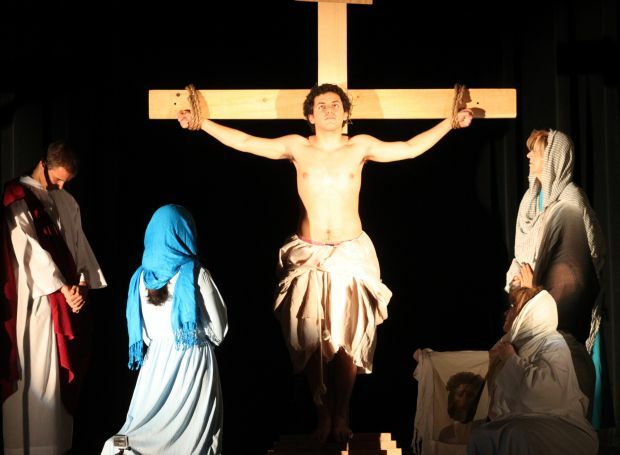 Jesus was portrayed by senior Jason Sadek of Phoenixville and his mother Mary was portrayed by faculty member Melanie Picard of Philadelphia. The women of Jerusalem as well as Veronica were portrayed by Devon Prep faculty and staff. All the actors wore period costumes. The reenactment of Jesus’ last hours included poignant moments such as his sentencing, his falling under the weight of the cross, meeting his mother Mary, being helped by a stranger, having his tunic stripped off his body, and being nailed to the cross. The hour-long dramatization included music and narration. Devon Prep is a private, Catholic, college preparatory school enrolling nearly 300 young men in grades six through 12 and conducted by the Piarist Fathers. Its 20-acre campus is located in Devon. For more information call 610-688-7337 or visit the website.